•Specially designed to work with 88-and-newer Dresser/Touring models with OEM slotted seat. •Pad assembly includes high-quality polished and chrome-plated 184 mm (short) or 248 mm (tall),(7,25” or 9,75”) detent bar with a design that provides 51 mm (2”) of fore and aft adjustment. 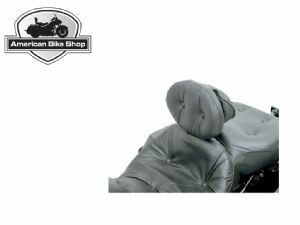 •All pads fold forward for ease of getting on and off bike. •Pad assembly options include a vinyl pillow-style to match tall pillow-style seats, and solarreflective leather styles that match both lower profile and tall seats; solar-reflective reduces surface temperature by as much as 14°C (25°F) for a cooler contact, higher durability and longer life over conventional leather or vinyl. •All large pad assemblies also include a pouch. 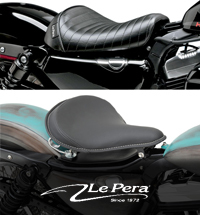 Short bar is for Street Glide, Road King and Road Glide-style low-profile seats. Tall bar is for Ultra-style tall-profile seats.